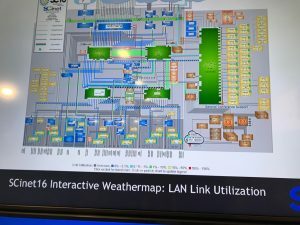 There were many successes of collaboration and engagement at SC16, the supercomputing conference that generated more than $10 million in economic impact for Salt Lake City. 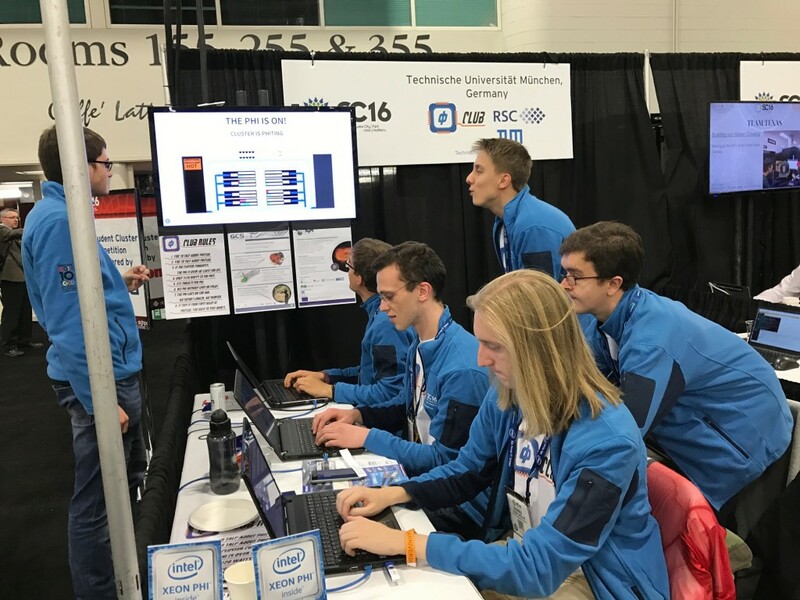 There were efforts to highlight the value of diversity, equity and inclusivity in STEM and especially the field of high-performance computing, which included large groups of high schools students from West High in SLC and from Provo. 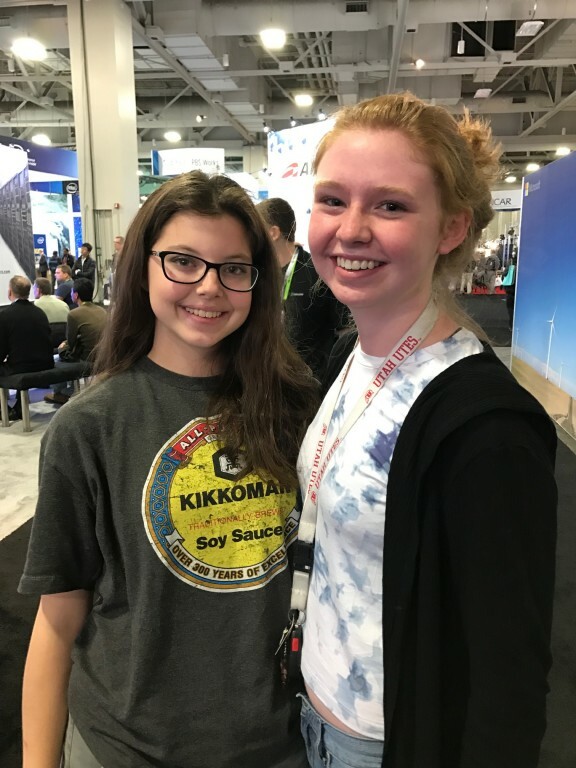 Nicole Andrade, Kelsie Muhlestein, West High School students in Salt Lake City at SC16. Enrique Arce-Larreta, a West High School physics teacher, said these field trips are essential in science and STEM education. “I still remember when I went on field trips as a kid. 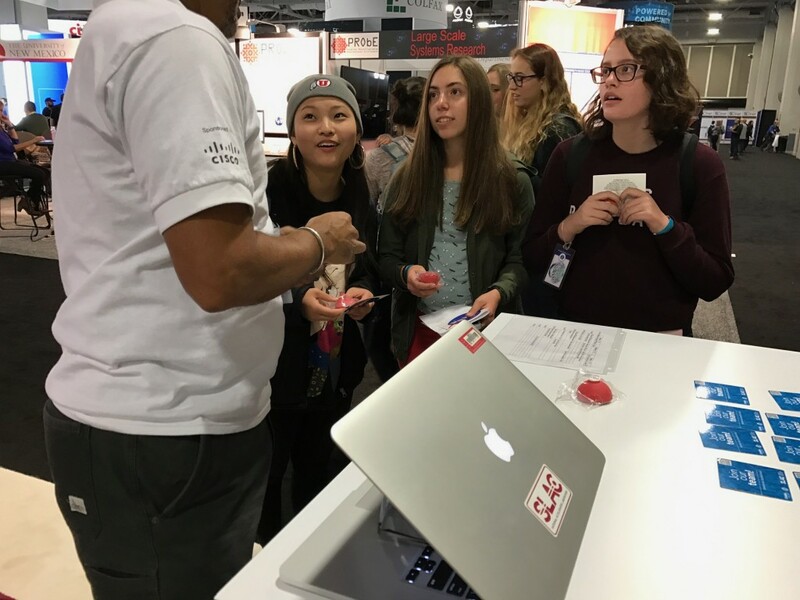 They show how real life works and help kids to hone in on what their STEM interests might be best for college,” he explained, adding that he advised an all-girls robotics team at the school. The early exposure to science and technology matters, said Arce-Larreta, whose family includes relatives who have worked in a science-related field. Andrade, a junior, explained that trips to museums she went with her father, who is a physicist, strengthened their family bond. Her interest is in higher-order mathematics including multivariable calculus. “I wasn’t really interested in arithmetic and math such as algebra,” she said, “but I like the higher levels of it because of the creative idea of solving a complex multivariable problem.” Muhlstein said she is interested in science and math, which comes from hearing her grandfather talk about his career as a chemist. Arce-Larreta said visiting the conference clarifies the direction a STEM-based curriculum could take to have a greater impact in schools. He hopes that the Salt Lake City School District eventually will make a computer science class a requirement for graduation. Earlier this year, the Chicago Public Schools, the third largest in the U.S., became the nation’s first school district to elevate computer science as a core requirement for high school, separate from math and science. Trish Damkroger, acting associate director for computation at Lawrence Livermore National Laboratory (LLNL) and a senior member of the SC16 leadership team, said previously the shortage of qualified computer science specialists could reach 1 million within the next five years. In an earlier interview with The Utah Review, she added, “The biggest challenge is finding the teachers to educate along the full pipeline,” and to help fill that gap requires expanding the STEM education focus in today’s middle school and high school classrooms. University of Science and Technology of China team, winners of SC16’s Student Cluster Competition. 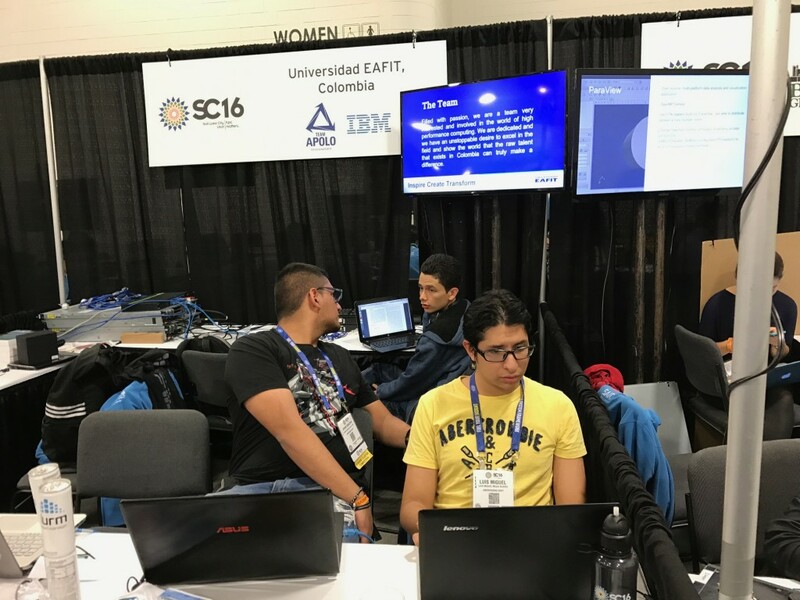 Meanwhile, students in teams of six individuals and two alternates from 14 universities representing the U.S., Europe, South America and Asia competed in a non-stop 48-hour race to complete a gold-medal class status workload of scientific exercises in high-performance computing. 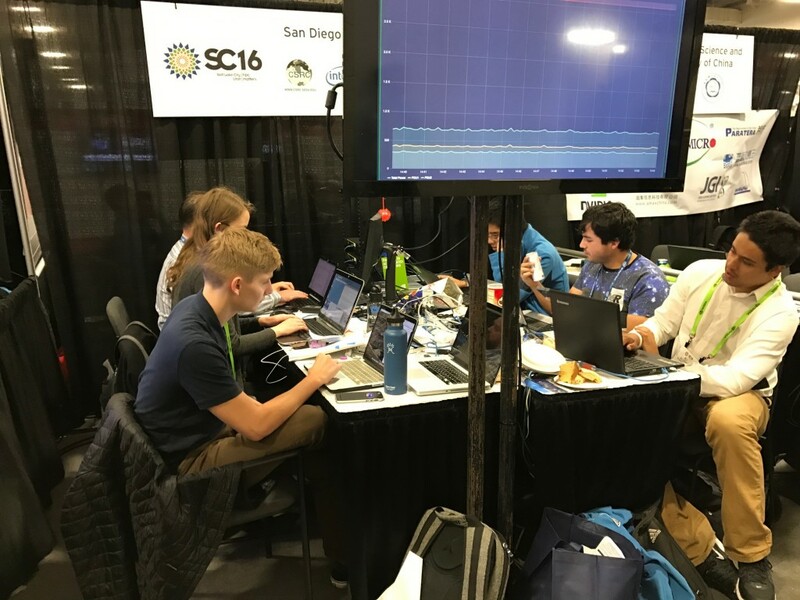 They accomplished this all while impressing a judging panel and conference attendees, dealing with a power shutdown on no prior notice and building an advanced cluster with hardware and software that could not exceed a 3120-watt power limit (26 amps at 120 volts) – roughly equivalent to an electric kettle or heater fan. 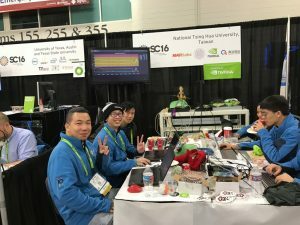 The University of Utah’s SupercompUtes team narrowly lost – “by an eyelash,” as described by Stephen Harrell, student cluster competition chair – to the University of Science and Technology of China in Hefei. The students were judged using a broad spectrum of metrics: throughput, correctness and understanding of real application workload; demonstrated understanding and performance of benchmark and mystery applications; high-performance computing presentation, conference engagement and interviews. 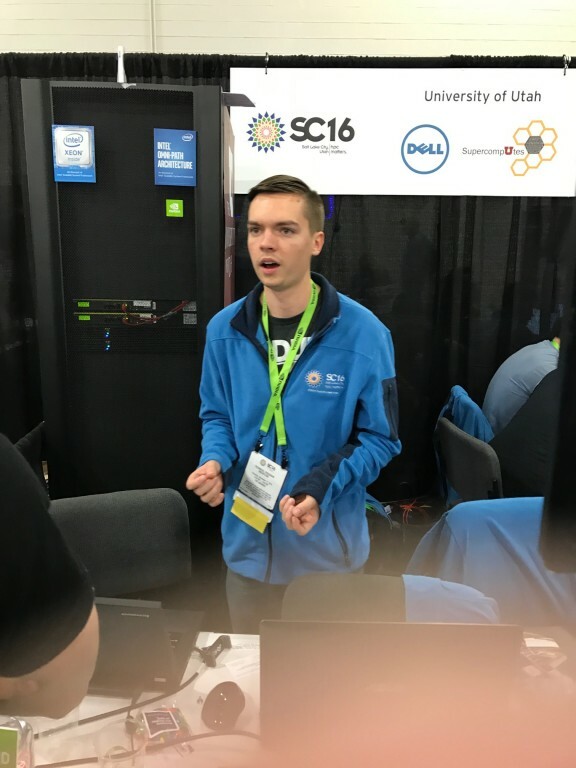 Kincaid Savoie, of the University of Utah SupercompUtes team, at SC16’s Student Cluster Competition. The exercises tested and enhanced many fundamental skills. For example, teams had to reproduce results from an award-winning scientific paper presented at last year’s conference and compare theirs to the original findings. Students used the ParaView analysis application to generate visual renderings and animations of astronomical simulation data. Teams knew that there would be a curveball of a power outage but they didn’t know when it would occur. The competition organizers pulled the plug at 11 a.m. on the second day of the marathon event. Fortunately, there were no failures or unexpected contingencies for SCinet, which provided the computational power of more than five terabits per second of internal network bandwidth, along with tens of 100 gigabits per second of Ethernet circuits to bring 3.15 terabits per second of Wide Area Network (WAN) bandwidth to the convention. Indeed, the world’s fastest computing network – which Lyonnais said was 10 times than the U.S. Navy’s capacity – worked seamlessly. This year’s network was built with various partners including the Utah Education Network and various businesses including, to name a few, CenturyLink, Ciena, Cisco, Coriant, Corsa, ESnet, Infinera, Internet2, Juniper and Zayo. At any one moment, at least 50 exhibitor’s booths (of the total of 349 in an exhibition space measuring 150,000 square feet) were using bandwidth of 100 gigabits or more per second, including a genomic computing exhibitor just across the aisle from the heart of SCinet operations that was using 1.2 terabits per second. Thanks to the coordination of more than 200 volunteers and dozens of universities and research institutions, Lyonnais said it was as ideal an operating performance as could be imagined. “There were perhaps 10 errors that occurred,” he said, adding that the few instances likely resulted from a cut in a portion of the fiber optic cable underneath the carpet that was installed in the exhibition space. 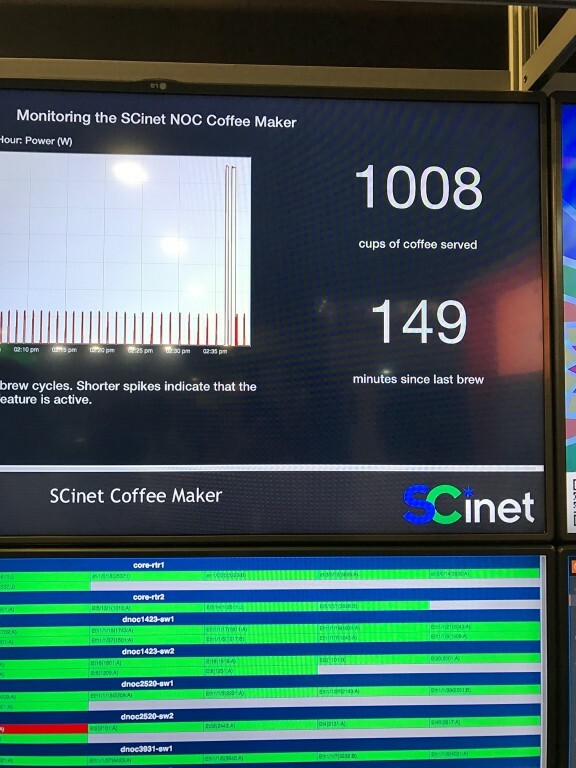 Organizers installed a dashboard that continuously updated usage, metrics and interesting bits of data such as coffee consumption, an essential for any individual in the world of high-performance computing. 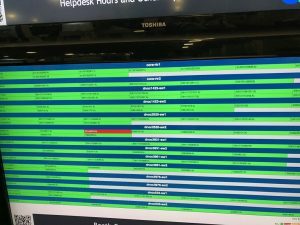 The dashboard also indicated the status of system performance at locations throughout the conference site. 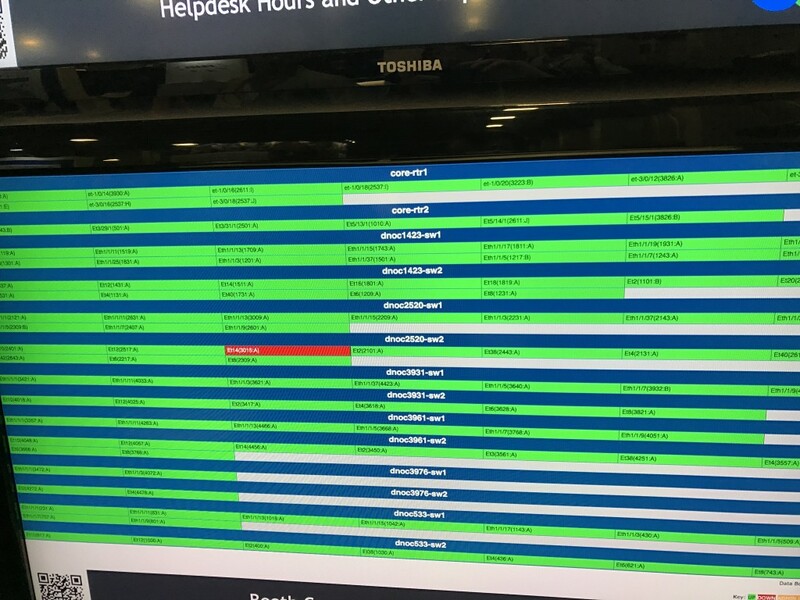 In the mid-afternoon on one of the busiest days of conference activity, there was only one red warning indicator of service issues at one booth. 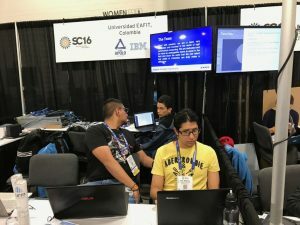 More than 11,100 attended SC16, with workshop attendance setting a record for the event, which was first held 28 years ago. Next year’s event, SC17, will be held in Denver.